IA: At 7:22 pm this evening, Long Beach Fire Department units responded Pier J Berth 243 to a reported crane accident with a trapped victim. Sizeup: Upon arrival units found the 42-year-old male driver pinned in the cab of his truck by a container that had fallen from the top of a stack. The container had been knocked free from the stack by the moving crane, bringing it to rest on the cab. 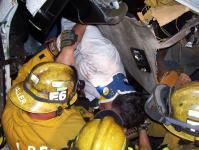 It took fire crews approximately 15 minutes to remove the patient from the wreckage. The driver was transported to a local trauma center in stable condition. The crane operator was taken by private vehicle to the hospital for evaluation. Resources: 13 firefighters from USAR 6, Truck 1, Engine 6, Rescue 1 and BC 1 as well as BLS 4 and PIO 2 responded to this incident that occurred in council district 2.